It’s time again for another installment of our 3 hour tour series. 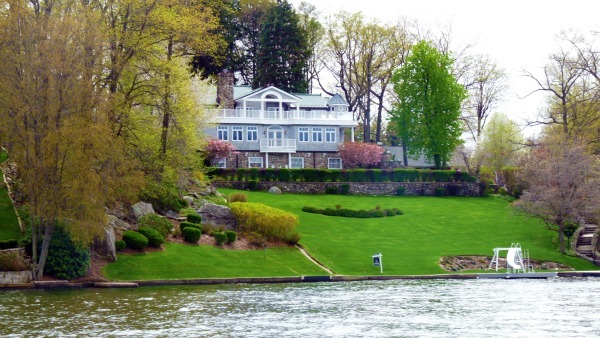 Where we take you house crashing to some of our favorite homes on our lake, as seen only by boat. We love exploring and looking at all the gorgeous waterfront homes, camera in hand to capture all the delightfully delicious details. I’m taking you back to a home we first featured on the last edition of the 3 hour tour series. Because, well, I’m in love with this house, the colors, the location, the yard, just about everything. What’s not to love? If I were going to build a house I think I would build this one. I’m a sucker for those round turret rooms and large expanses of lawn. I imagine being a kid a doing to “tootsie roll” down the grassy grassy hill. The best part is it’s location. It’s on the most amazing water cul-de-sac. 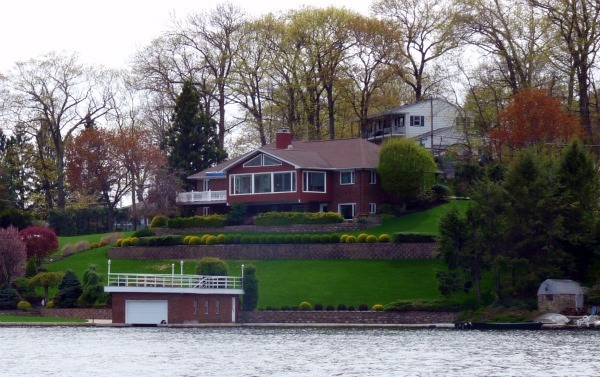 Nestled right into a cove that protects it from the harsh boat wakes of the main lake, right next to a home that has an equally extraordinary green grassy greatness. The two together are breathtaking. The neighbor is an older brick style home. I’m really fond of areas where homes have organically grown together over time instead of being choreographed sometimes not so successfully by a team of developers. Especially on such a wonderfully organic setting on the lake. It lends itself to an overall feel of a home grown community. Even the two lower buildings near the water are inviting. The right structure is the boathouse which let me tell you is an awesome luxury. Boathouses are basically a garage built over the water for your boat, now that would come in handy. The structure on the right I imagine is a wonderful guest house, many of the homes on the lake either feature and in-law suite or sometimes guest quarters. I wouldn’t mind being a guest there! So what do you all think of the 2 fabulous homes? Are they not dream places? Well thanks for joining us for another episode of our 3 hour tour. If you want to see more be sure to check out the 3 hour tour (part 1) and the 3 hour tour (part 2).